Thinking of an exotic week long getaway to Bangkok and Pattaya? The vibrant city life of Bangkok along with the serene beach and wild nightlife of Pattaya; you just cannot possibly wait! Wait, have you planned to keep yourself insured during your upcoming and fascinating trip? Chances are high that you haven’t because you simply don’t bother! Well, this might not be a smart idea. The very purpose of travel is to unwind; however, traveling without insurance would not let you relax. Once you are abroad, you may come across a myriad of unexpected and rather hazardous situations which can have you financially drained. A travel cover acts like a protection and offers safeguards from unlooked for non-medical and medical emergencies during your trip to Bangkok and Pattatya. If you opt for a travel plan for your much-awaited trip to Bangkok, Pattaya there are many ways to grab one. However, the best way is resorting to portals of insurance providers in India and find a policy that meets your needs best. Since there are over 20 insurers it is not worth spending time after each and every insurer by assessing the quality of their insurance products. 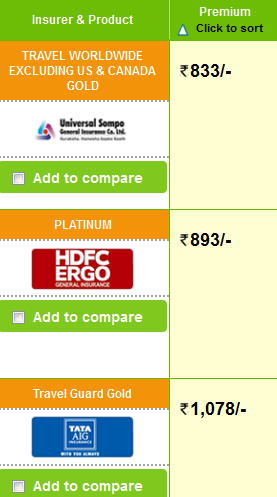 This is where insurance comparison portals like GIBL come into play. All you need to do is submitting your trip details and the portal will endow you with a multiple travel covers. The following table consists of your trip details. Assuming you are 35 year old and looking for a single trip to Asia (excluding Japan). Your trip duration is 8 days and your chosen sum insured is $200,000. There are 3 different policies available offered by 3 different insurer. The premiums are Rs. 833, Rs. 893, and Rs. 1078. Now, how will you cherry-pick the best travel plan among them? In simple words, the travel plan which will help you most in time of your need is the best one. Now, you need to figure out in exactly what situations you will need a travel policy. Once you understand those situations well you need to weigh all three policies on offer to see which travel cover is the most effective one to help you out of those situations. Typically, a traveler, especially while on a trip to abroad faces 4 trickiest situations. Let’s discuss about these 4 solutions and bring the best travel plan to light to tackle those situations well. One of the very common aspects of travel is unplanned and non-refundable expenses. That's quite fine with most travelers as long as they can spend the entire vacation as per their plan. However, there are some situations that you cannot control and trip cancellation or delay is one of them. You can’t help it but bearing the cost of delay or cancellation. In situations like this a travel plan comes into play and helps save expenses of travel policyholders. Most insurers provide coverage Trip Cancellation and Interruption, also known as a TCI. You should note that the coverage is on offer only if the TCI is caused by sickness and injury, death of close relative. These are the situations when you are eligible for compensation from your insurer. Let’s see what these 3 travel covers have in store for you in this aspect. Let’s start with Universal Sompo. The insurer with lowest premium (Rs. 833) is Universal Sompo. This travel insurance product comes under the Gold Plan as your chosen sum insured amount is $2,00,000 and it offers benefits for unforeseen events like trip delay and trip cancellation. For the total cancellation of trip, you will get $1000 and for delay you will get $30 for every 12 hours, maximum up to $120. For a sum insured amount of $2,00,000 you are eligible for the single trip Platinum plan. However, this trip doesn’t offer you any financial compensation in case your flight gets totally canceled. But, you will get compensation in case of flight delay. You are supposed to get $10 for delay of each hour up to a maximum of $120. Similar to HDFC ERGO, TATA AIG also doesn’t provide insured people with any monetary guard in case of flight cancellation. For trip delay, the company will, however, recompense you by paying $10 per 12 hours up to a maximum of $100. The travel plan offered by Universal Sompo is by far the best of the lot. The plan offers financial coverage in case of trip cancellation unlike other two travel policies. The compensation on offer for trip delay is better than the offering of Tata AIG. The compensation for trip delay is best with HDFC ERGO, however, the plan will offer you nothing if your trip is canceled altogether. Hence, your best bet will be the plan by Universal Sompo when it comes to getting paid for trip delay and cancellation. How will you feel when you can’t find your belongings anywhere after reaching your holiday destination? This is another tricky situation that you need to handle well. A travel plan will recompense in such a situation to replace some of your essential staffs in time. It is true that airlines offer compensation for the loss or damage of checked baggage. However, the amount, more often than not, falls short of actual requirement. For every pound of your baggage your airline will pay as little as nine dollars. Travel insurance companies, on the other hand, provide their policyholders with coverage for their bags and also for items inside. This is why you need to make a list of all the items along with valuables that you carry inside your bags. Your travel insurer will reimburse you for what you have lot as per their policy rules and regulations. The coverage amount varies from one travel insurance provider to another. Now, let’s see what these 3 insurers have to offer in terms of coverage for loss of checked baggage. If you opt for the travel policy of Universal Sompo you will receive $500 for loss of your checked baggage. This benefit comes with sub-limit as well; 10% for each article in the baggage and 50% per baggage. When it comes to paying for lost baggage, HDFC offers best benefit to their travel policyholders. You will get $1,000 for losing your checked baggage. This benefit however comes with similar sub-limit as that of Universal Sompo. There is a compensation of 50% per bag and 10% per item inside the baggage. The coverage in store for loss of baggage is also impressive. The insurer pays $1,000 for the loss of checked baggage. This amount doesn’t come with any sub-limit. In the aspect of coverage for loss of baggage, the travel plan of Tata AIG seems to be the best. The one-time is amount is similar to that of HDFC ERGO, but there is no sub-limit associated with it. The travel policy of Universal Sompo comes with sub-limit and one-time compensation amount is also $500 less than other two policies. Another compelling reason why a travel cover is a must-have especially when you are holidaying abroad is the coverage for sickness during trip. Even if you have a valid health cover, that will cease to be effective in foreign cities like Bangkok and Pattaya. This is where a travel plan offers monetary protection and saves travelers like you who falls sick and see medical professional from huge expenses. Some health insurers operating in India offer coverage for medical treatments overseas. But you cannot trace out any insurer in India that provides coverage for medical evacuation. You need to have a travel cover to tackle situations like this. Let’s see which insurer can help you out from such a dire situation. All three insurers have coverage for emergency medical evacuation. However, the coverage offered by Tata AIG seems best of the lot. Let’s have a look at table of TATA AIG single trip benefits. Similar to health coverage, a travel insurance policy also offers compensation to policyholders or their nominees in case of death or dismemberment of insured people. All these 3 travel insurance companies offer coverage for such untoward events. Let’s weigh which offering is the most effective. Universal Sompo offers 100% of sum insured amount in the event of death of the insured people. If the policyholders like you suffer from permanent total or partial disablement, this insurance provider pays out compensation based on the intensity of the disablement. The amount of benefit is mentioned in the table below. This insurer offers $5,000 as compensation in the event of the accidental death (common carrier) of the insured people. The amount of compensation for permanent disablement (common carrier) is also the same; $5,000. For other than common carrier, in the event of accidental death or permanent disablement, the amount of compensation is $20,000. The offering is better in case of Tata AIG. 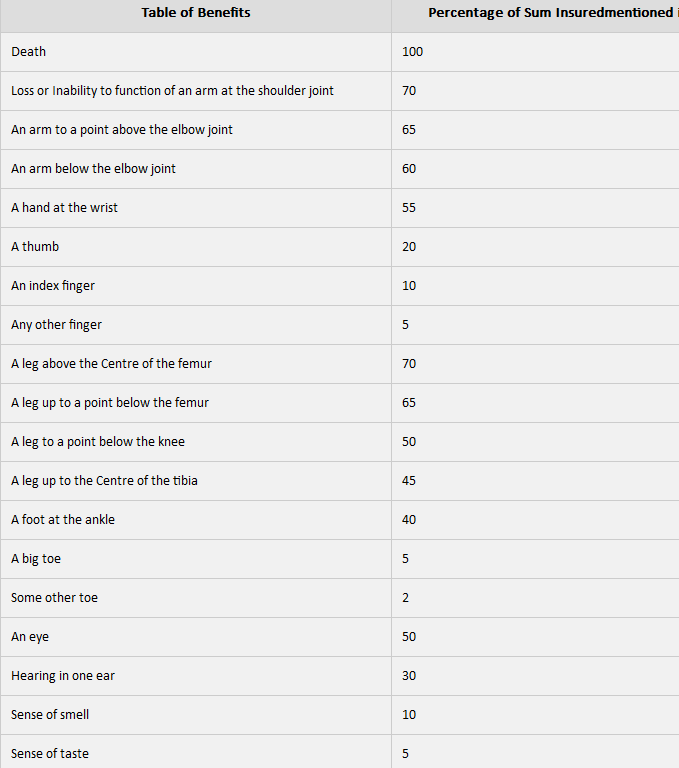 They offer $15,000 in case of accidental death and dismemberment (24 hours). This insurer further offers $5,000 in case of dismemberment and accidental death in common carrier. Universal Sompo and Tata AIG are two leading insurance houses when it comes to covering unfortunate events like death and disablement of the insurer. However, the travel plan of Universal Sompo is even better as they offer total sum insured amount in case the insured people dies. All three insurance houses that have plans relevant to your travel insurance needs don’t offer excellent coverage for all 4 situations. Universal Sompo’s travel plan seems to be the standout one of the lot as their coverage for the most compelling situations; death and dismemberment is best and that too at the lowest premium of Rs. 833. Hopefully, your trip to Bangkok and Pattaya will be a memorable one. By armed with a travel plan with necessary protections you will be able to tackle all untoward events firmly and confidently.